A metal alloy that is liquid at room temperature. Suppose you had a metal alloy that had the advantages of liquid mercury, but without the toxic effects? You could make your own barometers and thermometers, and not worry about calling in a hazardous materials team to clean up after any accidents. You could simply wipe up the mess with a paper towel. You wouldn't have to worry about breathing in toxic mercury fumes, but you could still make neat little electric motors that dip into liquid metal to make their electrical connections. Suppose further, that the metal would stick to glass, so you could paint it on glass to make your own mirrors. Or that it would stick to paper so you could draw your own electric circuits in it? The gallium is liquid because I had the bottle in my shirt pocket, next to my warm body. At normal comfortable room temperatures it is a solid. 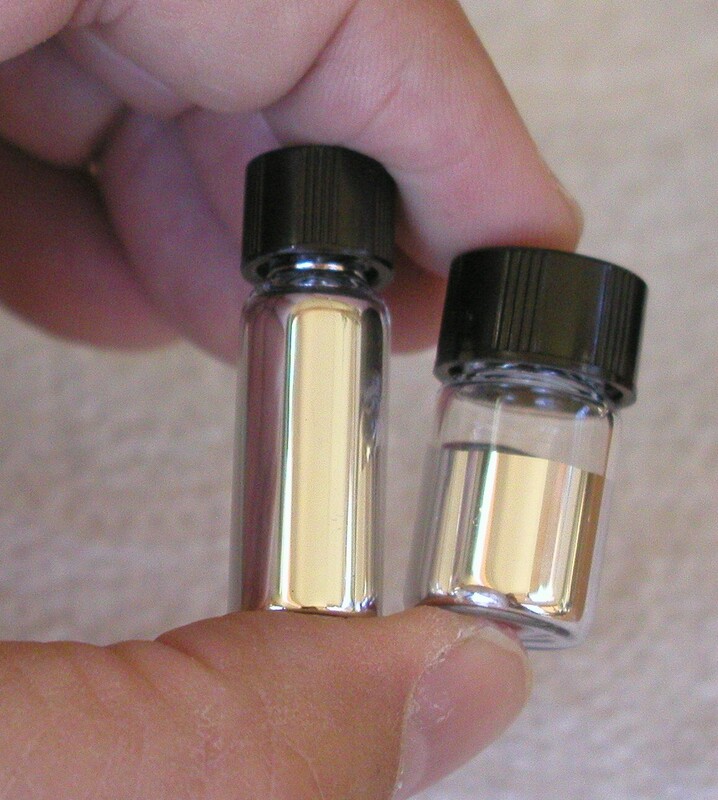 Because gallium expands when it solidifies (unlike most metals), the vials are only filled half way. To get the solid metal out of the vial, simply warm it up in a cup of hot water until it melts. 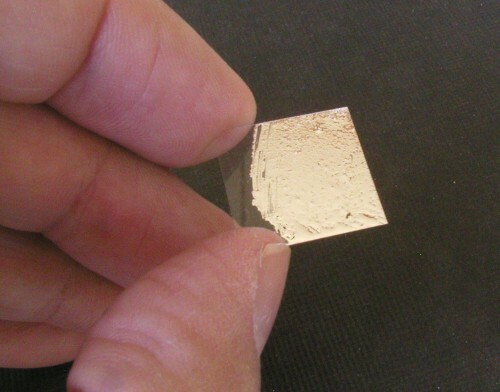 One fun thing you can do right away with the liquid metal alloy is make your own mirrors. 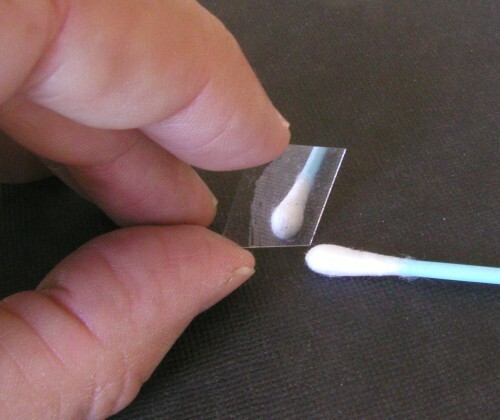 All it takes is a piece of glass and a cotton swab. 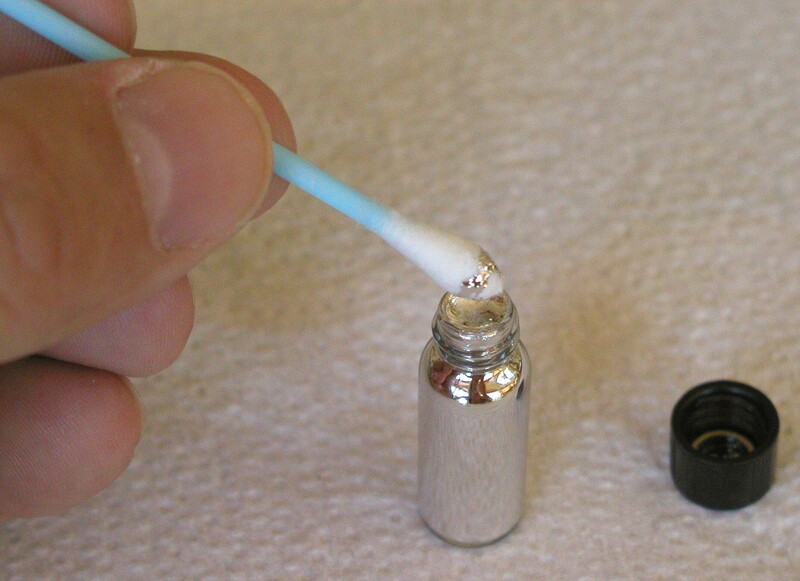 Dip the cotton swab in the vial, and twirl it around to coat it with the liquid metal alloy. Now rub the coated swab on the glass (in the phot we are using a glass microscope slide). 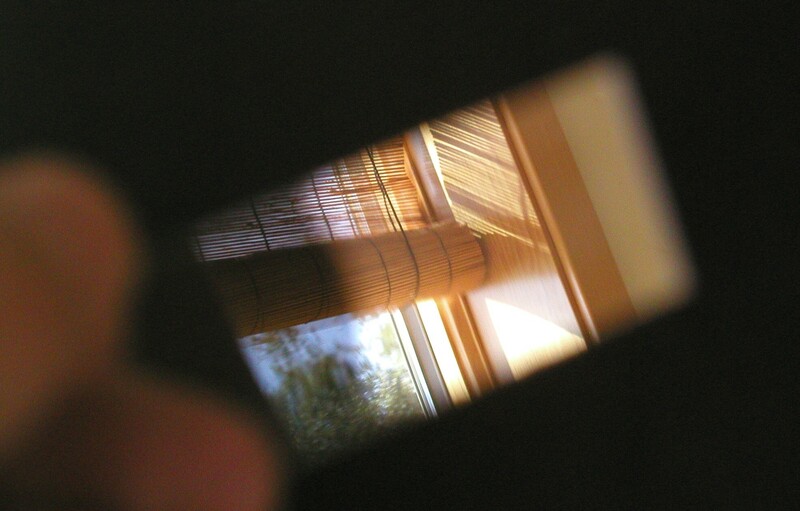 The metal sticks to the glass, and makes an opaque reflective coating. In the photo above, I am holding the new mirror so that it reflects the view of the trees outside my window. The camera is focused on the window, so the trees and my hand are out of focus. Being able to make your own mirrors is an advantage when the mirror you need can't be bought anywhere. For example, I needed a small lightweight mirror to glue to a speaker, so I could bounce a laser beam off of the speaker and have the music wiggle the mirror, making a pattern on the wall. 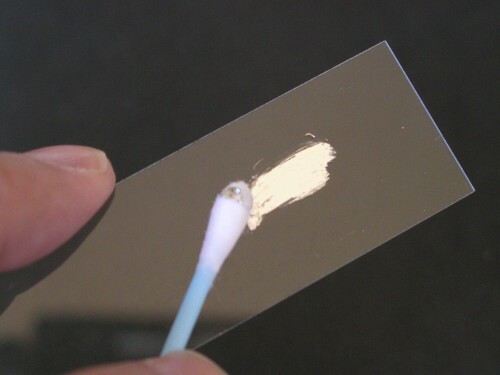 I used the liquid metal to coat a thin glass cover slip for a microscope slide. The resulting mirror was very lightweight, and yet stiff, so it would remain flat while being bounced around by the speaker. When it is glued onto the speaker and the music turned on, the laser makes a light show on the wall. Using two speakers, and bouncing the light off of one and then off of the other, gives you two dimensions, and you can make a computer sound file that uses both stereo channels to draw pictures on the wall. If you need a shiny surface, a dilute solution of hydrochloric acid can be placed on the surface, or you can use a light coating of mineral oil. Both will prevent the slow oxidation of the metal that occurs over time. Gallium is an element (atomic number 31, right below aluminum and just to the right of zinc in the periodic table of the elements). It starts out with a very low melting point already, but we can add some other elements to get an even lower melting point. Right below gallium in the periodic table is indium (element 49). Just to the right of indium is tin (element 50). When these elements are combined, their atoms bind together into a compound. The molecules of that compound do not bind to one another as much as the atoms of the original metals bound to each other. This lowers the melting point. Each combination will have a slightly different melting point. Which do you think has the lowest melting point? This might make a good science fair experiment. 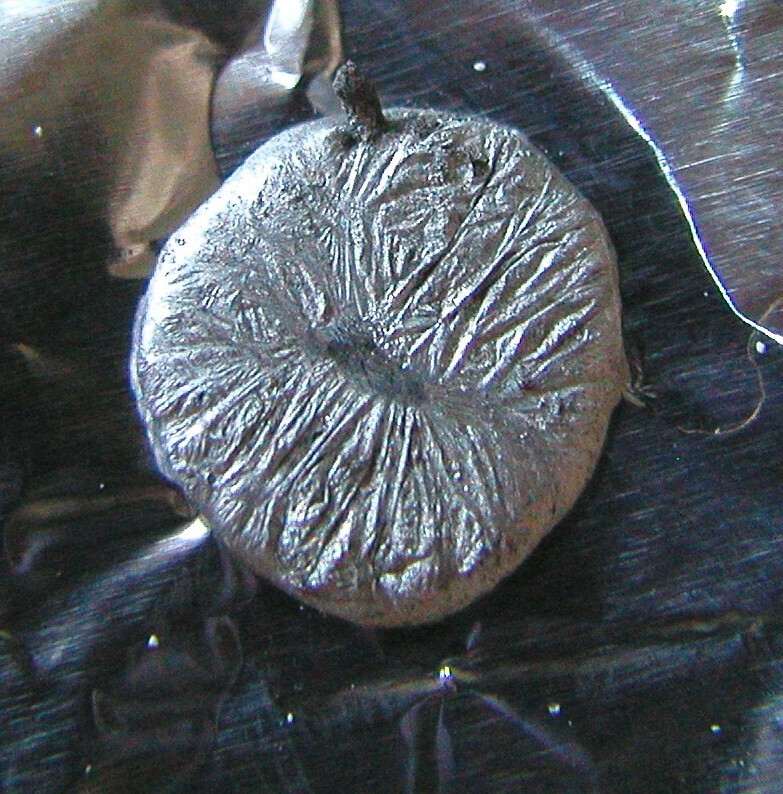 A mixture of 76% gallium and 24% indium melts at 16° Celsius (61° Fahrenheit). Both gallium and this combination can be supercooled. That means that once melted, they can stay liquid even though they are cooled well below their melting points. Eventually a small crystal forms, and starts the whole batch solidifying, but small amounts can be kept supercooled for quite a while. The gallium-indium alloy is more reflective than mercury, and is less dense, so it is being explored as a replacement for mercury in spinning liquid mirrors for astronomical telescopes. When gallium is exposed to air, a thin layer of gallium oxide forms on the surface, just like what happens with aluminum, the metal just above it in the periodic table. This allows gallium alloys to "wet" almost any material, so instead of beading up, it spreads out over the surface. This property makes it good for making mirrors, and for coating objects to make them conductive. In the same way that mercury alloys with other metals to make amalgams, gallium also alloys with other metals. 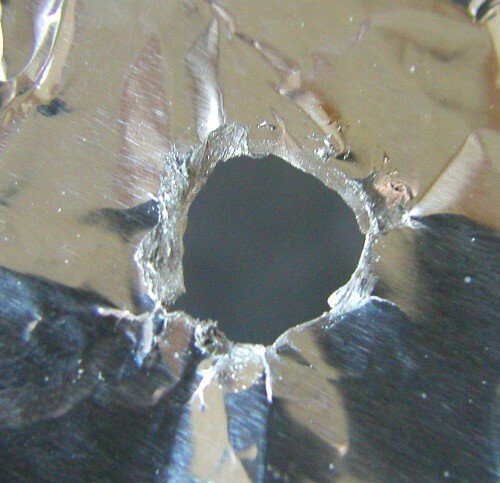 When a small drop of gallium is placed on aluminum foil, for example, it will combine with the aluminum to make a liquid with a crusty surface, as in the photo below. The alloy eventually combines with all of the aluminum, dissolving a hole in it. 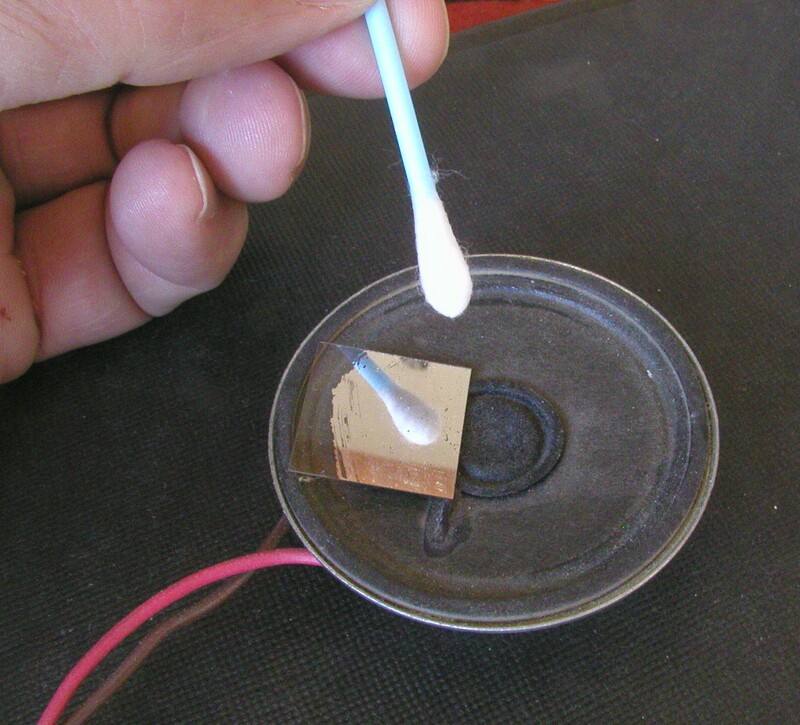 This experiment can be done with either the gallium, or the gallium-indium-tin alloy. Order Gallium and Liquid Metal Alloy here.